Idle Hands: Announcing Breaking Bad TITANS "The Heisenberg Collection"
From Sony and Titan Merchandise, comes The Heisenberg Collection, celebrating the hit series Breaking Bad! 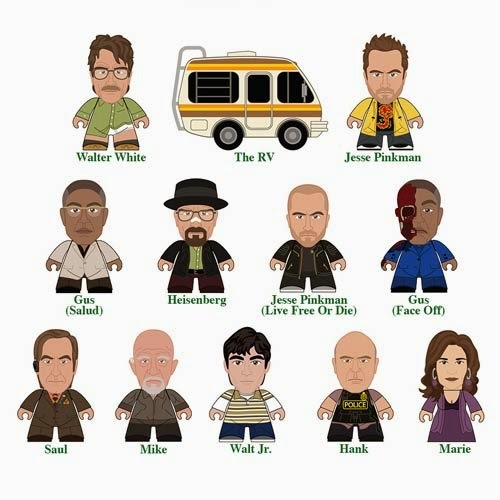 This 12 piece set features mild mannered chemistry teacher Walter White as well as his murderous, drug dealing alter-ego Heisenberg, his naïve partner in crime Jesse Pinkman and a whole barrel full of friends and foes, including The Crystal Ship itself – The RV! Each figure is 3" blind-boxed and some come with a character specific accessory. PLUS: 4 hidden chase figures for you to hunt and collect! As ever this range is designed by the incredibly talented Matt JOnes aka Lunartik who can be found at his website here. TITANS are available to purchase from: Forbidden Planet in the UK and Europe, and Entertainment Earth and Diamond Comics in the US!